Turkey’s largest winter and snow holiday center, national park, Uludag is open during the season from October to April, offering a wide range of opportunities for winter sports lovers. 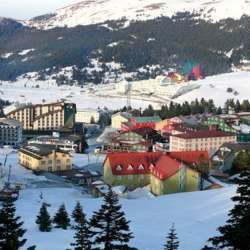 It is located 2,500 meters above the sea level. At the Uludag Ski Center you can find many activities such as skiing, snowboarding, biathlon, skiboarding, skibob, sledding, White Fest winter festival where famous DJs and artists take place every year and After-Ski Party. You can also reach Uludag with Bursa Ropeway, which offers a wonderful winter holiday experience for the semester break. We will visit the mountain to discover hiking trails, ski slopes, popular night life, and the best cafes with warm wine 🍷 and grilled sausage. Our package includes two nights of weekend stay with Full Board hotel accommodation and luxury bus transportation from different points in Istanbul. The fee is 400TL per night per person based on double occupancy. Single stay difference is 200tl extra. Plus 150tl transportation. Total is 950tl for double room per person, Protected content for single occupancy. Good news is that, we will get to enjoy famous dish Iskender Kebap on the way back to Istanbul over Bursa. Early morning (5am) the bus will pick us up in Istanbul from different locations and take us to our hotel in Uludag. We will go straight to ski rental and get ours for a discounted price of 40tl per day. We can hit the slopes right away for those of you who are ready. Some of you might want to purchase 1/2 day on Friday and hit the slopes in the afternoon. We will meet at lunch 🥙 and check in to our rooms. After lunch, we will continue skiing. Then around 5pm we finish and get together for warm tea 🍵 and boreks, cakes 🧁 delicious pastries. Friday night, after dinner, we have an option to go to a sports bar or for a live music at Grand Yazici or stay at hotel to relax. We will have a full day for activities. Most enjoyable part for me is to take a break for lunch on one of the cafes with an open fire place on top of the slopes! We can take a break there and drink a warm wine 🍷 eat sucuk ekmek (turkish sausage) instead of going to the hotel for lunch. Saturday night the hotel will arrange a live music for us 🎶 🎼 🎵 (on the house). We have known the guitarist for many years now, and I guarantee you an amazing fun night!! After checking out, we will have time until 4pm to ski, or just walk around the nature, sit by the fire 🔥 etc. Our bus will pick us up at 5pm. On our way to Istanbul we will stop at Iskender to enjoy delicious Bursa’s famous dish. 150tl round trip. Cakes, tea and coffee will be provided. There will be a 15 min break on the way to Uludag. For the departure times and places please see the photo. The hotel is nicely run, simple, clean and warm. The food is really very good. This will be our 5th year there. Hotel general manager will be on site to join us day and night to take care of us. Full Board (all meals plus tea time included). Soft drinks and alcohol is not included. Water will be provided during meals. Please respond in your earliest convenience since we have a short time left. Please PM or call for details.